Excerpt from the public program Painting Process/Process Painting, featuring artists Chuck Close and Carroll Dunham. Held in conjunction with the exhibition, What Is Painting? Contemporary Art from the Collection. Part 1 of 2; edited for time. For more information about the exhibition, please visit http://www.moma.org/exhibitions.php?id=5139. 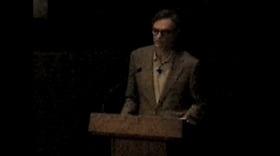 For a full audio recording of the presentation as well as the conversation with Chuck Close, Carroll Dunham, and curator Anne Umland, please visit http://www.moma.org/audio or the ThinkModern podcast in iTunes. "Carroll Dunham Prints: A Survey"
Prints by artist Carroll Dunham will come to the University Art Museum Feb. 2-April 3. This exhibition marks the first museum study of this distinguished body of work.